This provides for 3 complimentary tickets for monthly events. This provides for 1 complimentary registration to the (1) monthly event of your choice. This provides for 2 complimentary registrations for 1 event of your choice. 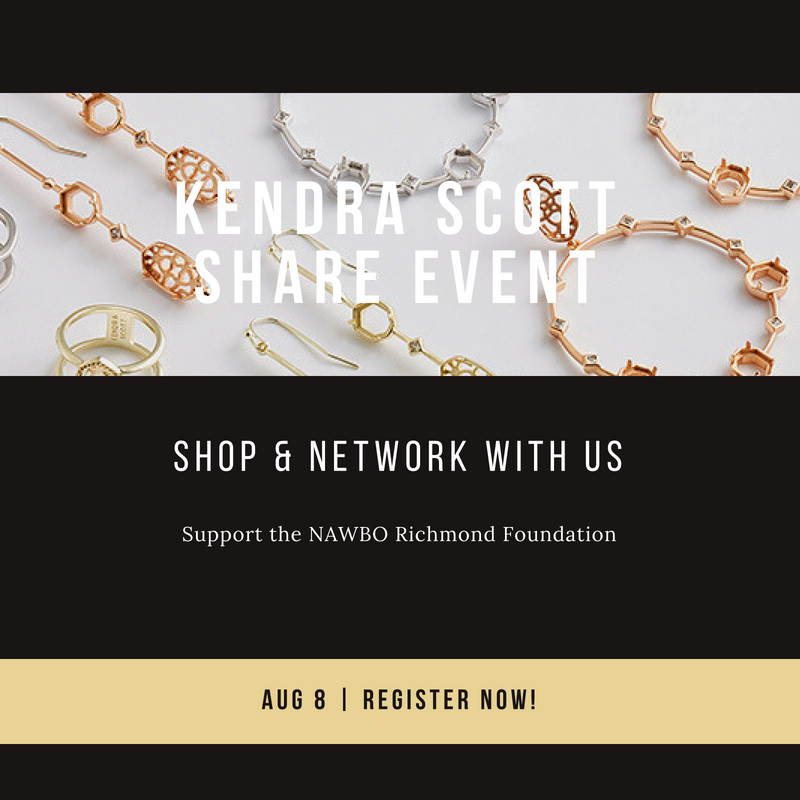 Join us for a Kendra Scott Share event to enjoy networking with your NAWBO Richmond members. This will be an opportunity to build your relationships, support the NAWBO Richmond Foundation, and have a lot of fun too! This is a free event! We encourage RSVPs for planning purposes and we encourage you to invite friends, colleagues, neighbors to join us for this fun opportunity. Thanks to Kendra Scott for their sponsorship of this event! We will be viewing their new fall line as well as enjoying music and refreshments. Come enjoy some fun and an opportunity to continue to build your NAWBO Richmond relationships. Directions to Kendra Scott: Once at Short Pump Town Center, park at the main entrance at Pottery Barn and Crate and Barrel. At the fountain, go down to the right, Kendra Scott will be the 3rd store on the right (next to Francesca's). Questions? Call 804-901-8785 or email katie@nawborichmond.org.